Farmers will have to destroy all grain contaminated by floodwater, and many are worried about making good on previously signed contracts to deliver crops. There's nothing the government can do about the millions of bushels of damaged crops in Iowa and other flooded states, since the Department of Agriculture has no program that covers the catastrophic and largely uninsured stored-crop losses from the widespread flooding that was triggered by the "bomb cyclone" that hit the region in mid-March. But Congress would have to pass legislation to address the harvests lost in the storm, according to Agriculture Under Secretary Bill Northey and a USDA statement to Reuters. Some Congress members have expressed interest in pursuing legislation to provide aid for damaged crops in storage, Northey said. But passing legislation could require a lengthy political process in the face of an urgent disaster, Sen. Charles Grassley, R-Iowa, told farmers at a meeting in Malvern, Iowa. "If we have to pass a bill to do it, I hate to tell you how long that takes," said Grassley. Near Percival, Iowa, railroad tracks leading up to a grain facility were flooded and broken. A Deere & Co dealership, Wendy's restaurant, Motel 6, and gas station nearby were also underwater, along with homes, cars and farm equipment. Some farmers moved machinery such as tractors on to highways to keep it out of the path of the floods. 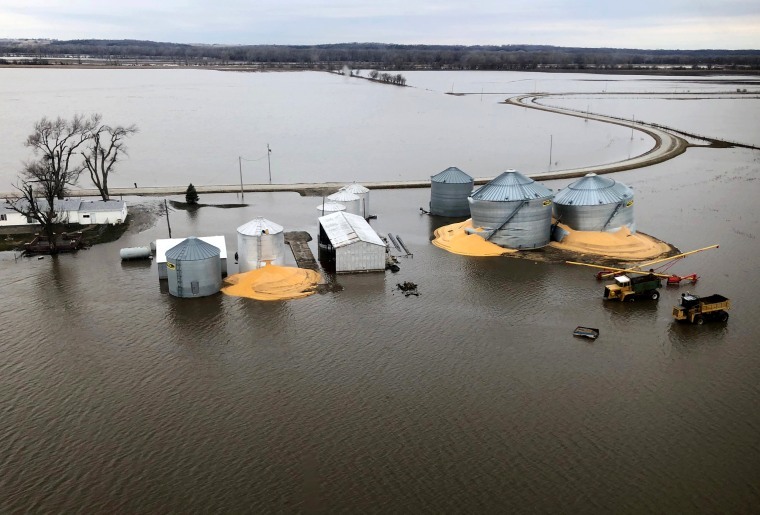 Iowa's agriculture secretary Mike Naig said the government also should help compensate farmers for some of the grain that was damaged. "They spent all last year raising that crop, putting it in the bin and they maybe already have it marketed," he said. "And now they're going to have to spend time just to get rid of it — just to clean the place up."